This website has been a side project of The Crisses since 1996. In 2017, with a 50th birthday looming and knowing their family genetics don't make a long life promising, they decided that Kinhost.org shouldn't be a side project anymore. With a goal of helping people with DID across Mother Earth, and offloading their brain trust into usable materials for all posterity — they relaunched their podcast, launched a Patreon campaign to allow for ongoing community support, and hoped that the community would agree to foster building this immense and valuable resource into something that would be a legacy. 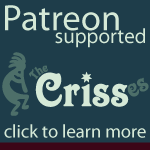 Whether you can't spare a dime and support us in other ways, can only be a one-time supporter and toss a few bucks into the tip jar, hire the Crisses as a life coach to help with personal management and internal community issues, or become an ongoing Patreon supporter, it's all making a difference in moving The Crisses towards full-time content production for Kinhost.org, the Many Minds on the Issue podcast, completing the books and materials for The Crissing Link series (like the United Front self-help book, companion workbook, etc.). There's at least 10 years of full-time content production to be put into physical reality or at least electrons on a screen that would create a one-stop resource for persons who need help with internal community issues. Your support helps, no matter how small. Maybe there's something that's been on your Wish List that you can get here rather than through someone else. FOLLOW The Crisses on Patreon.com and you'll get our public updates, notification when new podcasts are published, and so on. If you can't follow The Crisses because this is your Secret Superhero Identity, then follow Farm-A-Yard (where The Crisses are a 1/3 partner, but it's totally UNrelated to mental health issues — it's about growing food, kid-safe, and fun)! Going to Patreon to look at Farm-A-Yard posts will act as a reminder — then you can sneak a peek at what's going on on The Crisses's Patreon page and no one will be the wiser!!! Contribute. Send us new original articles, links to interesting articles & research, book reviews, movie reviews, and additional information that can be posted on established pages, etc. This used to be an open-edit website, but there was too much spam. We can give people access to the public areas and your own section for your system on the back-end if you become a regular and trusted contributor. Comment on posts, pages, podcasts throughout the website. Comments drive traffic. Traffic may mean people with money who can donate cash. So even just helping with SEO, comments, traffic helps! We're the only one who can see your email, and you can use a fake email and any name you'd like! You won't be emailed by the website software. Send us a testimonial, idea for an article, question for the podcast, comments or corrections, or just fanmail telling us how helpful the site is. Motivation, praise, inspiration — it's all important! Contact us! Become an ongoing supporter of Kinhost.org and The Crisses on Patreon. If you're afraid to support Kinhost.org or The Crisses directly, you can also check out our Farm-A-Yard Patreon campaign — we're a 1/3 partner on a grassroots movement to help people convert their lawns into food-production sites. By supporting Farm-A-Yard you're covertly supporting The Crisses and another great cause! If you find this site, the podcast, the United Front Boot Camp, etc. helpful, then send us a tip. If you need to add personalized coaching to your list of self-help and self-healing services, then please consider hiring The Crisses as your life coach. We offer sliding-scale pricing for our peers and folk on assistance programs. Until we move to full-time content production, we are still running our graphic design & desktop publishing business. If you need a book formatted, a cookbook edited or formatted, business cards, postcards, stationery, calendars, car magnets, etc. please consider using our services at Eclectic Tech, LLC. Purchase our books! This is a great way to contribute and get something in return. We have a Books link on this website to help you out. This includes the multiple-topic books in The Crissing Link series, planners that we've developed as a life coach and designer, and our self-help book on personal energy management. There's some Amazon affiliate links to other books for multiples there, we get a tiny kickback and it doesn't cost you anything extra to order them — so if you've been thinking about buying them anyway, it benefits us if you follow our link to the book. Buy SHWAG. We've had a Kinhost CafePress shop but we just don't push it. And The Crisses opened up a little Teespring shop too. You can be decked out loud and proud — or just get something else. If you're considering creating online courses, or you need a book proposal to send to traditional publishers, we have Microsoft Word and Scrivener templates to help you out at Fiverr.com. We also have some other services that we offer there. Take one of our classes on Udemy.com. If you use our coupon, we get a bigger cut. This is the lowest price you can get out there. We have a Raising Chickens in your Backyard course and our Improve Your English Vocabulary with Over 140 Tricky Words featuring tricks for how to tell words that sound alike apart.